Hematopoiesis is the synthesis of blood cells. Pluripotent hematopoietic stem cells in the bone marrow divide and differentiate into erythrocytes, leukocytes, or megakaryocytes. Replication and differentiation are regulated by hormones, cytokines, and growth factors. The aggregate weight of adult bone marrow is 3 kg, comparable in mass to the liver. Bone marrow is categorized by appearance as red or yellow. Red bone marrow consists of hematopoietic cells interspersed with sinusoidal capillaries. Yellow bone marrow has a limited number of hematopoietic cells, and the yellow appearance is from adipose. New cells synthesized in bone marrow enter the circulation by way of the marrow sinusoids. In utero, active hematopoiesis occurs in the liver and spleen. 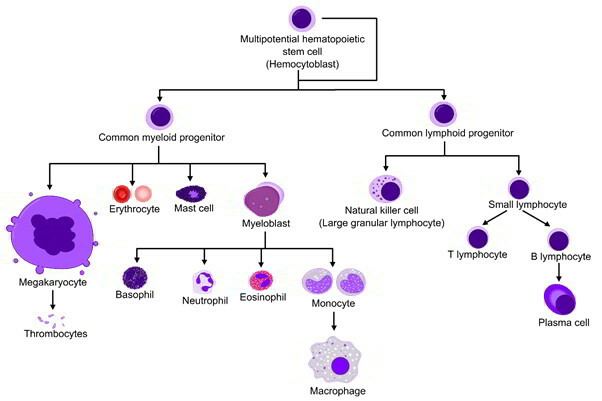 At birth, all bone marrow is active in hematopoiesis. Following puberty, the red bone marrow in the shafts of the long bones is gradually replaced by yellow bone marrow. The femur and tibia have functional bone marrow up until about the age of 20 years. In adult life, erythropoiesis is found only at the ends of the long bones and in some flat bones, such as the vertebrae, sternum, and ribs. Erythropoiesis is the synthesis of RBCs. RBCs arise from the hematopoietic stem cell line, and differentiation into a mature RBC occurs over 7 days. RBC production requires functional bone marrow, erythropoietin, thyroid hormone, and adequate supplies of iron, vitamin B12, folic acid, pyridoxine, and protein and traces of copper. The absence of any of these components leads to either an impaired rate of RBC production or to the formation of atypical cells. Stem cells differentiate into RBCs and synthesize their major intracellular protein, hemoglobin. One molecule of hemoglobin is composed of four protein chains, each of which surrounds an iron atom core. Hemoglobin is specialized for transport of O2 and CO2. Iron is essential to hemoglobin production. Total body iron ranges between 2 and 6 g. Hemoglobin accounts for about two thirds of the total iron, and the remaining iron is in the bone marrow, spleen, liver, and muscle. As an iron deficiency develops, the latter iron stores are depleted first, followed by a gradual loss of the iron contained in hemoglobin. Immature erythrocytes leave the bone marrow via veins in the marrow and enter the general circulation as nucleated reticulocytes. After their release from the marrow sites, the reticulocytes travel to the spleen, where they lose their nucleus and evolve into mature erythrocytes before being released back into the circulation. The hormone erythropoietin controls the rate of RBC formation. Erythropoietin is synthesized primarily in the kidneys. Tissue oxygenation controls erythropoietin release. Anemia or prolonged exposure to altitude (hypoxia) increases RBC synthesis. Impaired cardiac or pulmonary function also increases RBC synthesis, as does pregnancy. It takes 5 days for erythropoietin to increase the rate of RBC formation. Erythropoiesis can replace about 1% of the circulating RBC mass each day, or about 100 million cells. Under maximal stimulation, bone marrow can increase this rate of synthesis eightfold, forming up to 800 million new cells each day. Anemia results from an imbalance between the rate of RBC synthesis and the rate of RBC loss. RBC synthesis may be decreased by deficiencies in iron, vitamin B12, intrinsic factor, or folic acid. Anemia can also result from the RBC loss that accompanies hemorrhage and from the increased fragility characteristic of the sickle cell mutation.